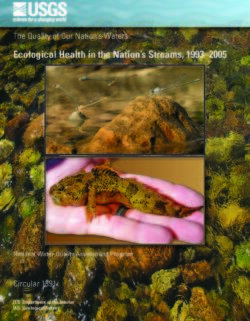 This report summarizes a national assessment of the ecological health of streams done by the U.S. Geological Survey's (USGS) National Water-Quality Assessment Program (NAWQA). Healthy functioning stream ecosystems provide society with many benefits, including water purification, flood control, nutrient recycling, waste decomposition, fisheries, and aesthetics. The value to society of many of these benefits is substantial; for example, sportfishing in the United States generates an estimated annual economic output of $125 billion, including more than 1 million jobs (National Research Council, 2005; American Sportfishing Association, 2008). Continued monitoring and assessment of the Nation’s streams is needed to support informed decisions that will safeguard this important natural and economic resource. The quality of streams and rivers is often assessed with measures of the chemical or physical properties of water. However, a more comprehensive perspective is obtained if resident biological communities are also assessed. Guidelines to protect human health and aquatic life have been established for specific physical and chemical properties of water and have become useful yardsticks with which to assess water quality. Biological communities provide additional crucial information because they live within streams for weeks to years and therefore integrate through time the effects of changes to their chemical or physical environment. In addition, biological communities are a direct measure of stream health—an indicator of the ability of a stream to support aquatic life. Thus, the condition of biological communities, integrated with key physical and chemical properties, provides a comprehensive assessment of stream health.